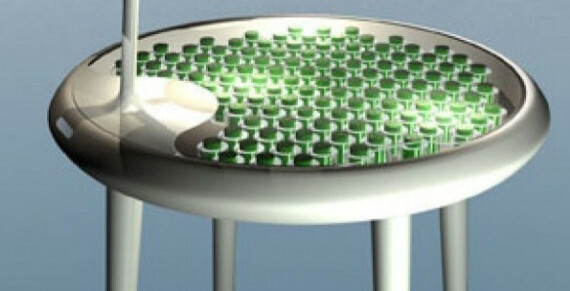 Featuring biological fuel cells made from moss, the table has been created by Alex Driver and Carlos Peralta from the IfM and Paolo Bombelli from the University’s Chemical Engineering and Biotechnology Department. A team of designers from the IfM's Design Management Group are exhibiting a novel 'moss table' at the London Design Festival this week. The table will showcase an emerging technology called biophotovoltaics (BPV) which uses the natural process of photosynthesis to generate electrical energy. Researchers are exploring how moss, algae and plants could be used as a source of renewable energy in the future. Still at early stages, BPV has the potential to power small devices such as digital clocks. Low cost BPV devices may become competitive alternatives to conventional renewable technologies such as bio-fuels in the next ten years. The table is based on research into biophotovoltaics funded by the Engineering and Physical Sciences Research Council (EPSRC). This pioneering work involves collaboration between the Departments of Engineering, Chemical Engineering and Biotechnology, Biochemistry and Plant Sciences at Cambridge University, and the Chemistry Department at Bath University. The research is led jointly by Dr Adrain Fisher, Professor Christopher Howe and Professor Alison Smith at Cambridge, and Dr Petra Cameron at Bath.